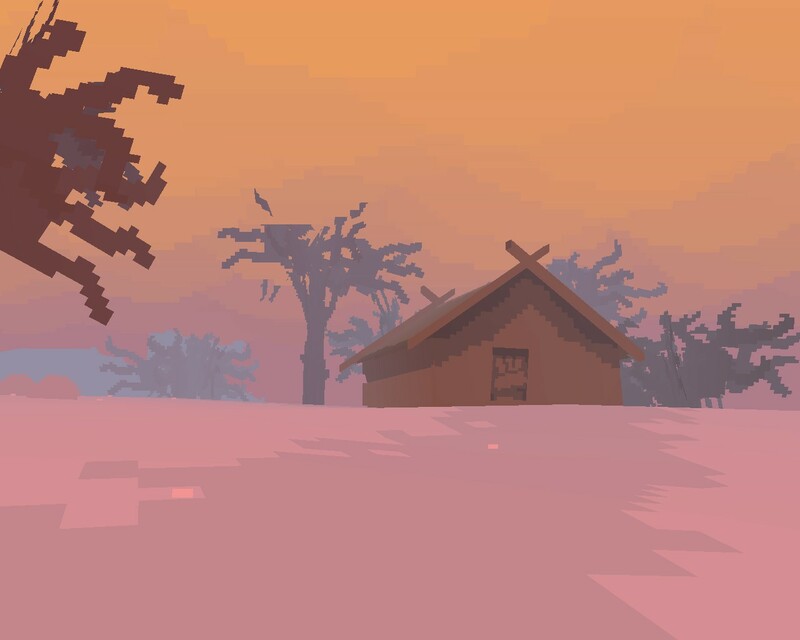 I should have made this blog entry a month or two ago, but then some stuff happened, and then some other stuff happened, and then I got sick. 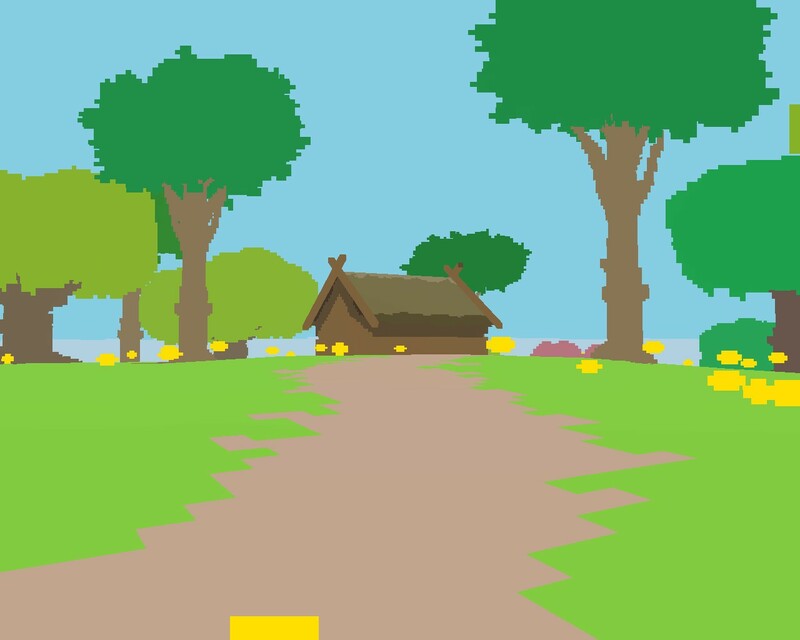 Regardless, I am happy to announce, slightly delayed but what the heck, a new EP by your third favourite Norwegian Casio-based lo-fi indie mostly-one-man-non-band band The Society Of Poor Academics, in collaboration with Canadian former-chiptune one-man-wonder-non-band band The J. Arthur Keenes Band: Between Love And Nothing At All. Featuring four tracks of varying degrees of freshness, released January 29th this year on San Francisco based Gray Sky Micro Press. Digital copies are available through Bandcamp, and limited edition physical copies (vinyl and reel-to-reel) are available through their webshop. I may be biased, but I really like this EP. It’s short (so it doesn’t overstay its welcome), it’s sweet (with lines like “f*ck you too” and “you will do for now”), it’s varied (including a remix and a song in Norwegian), and it’s affordable (only $1.99 for the digital copy). Not to mention the gorgeous, playful arrangements by Dan McLay, aka. 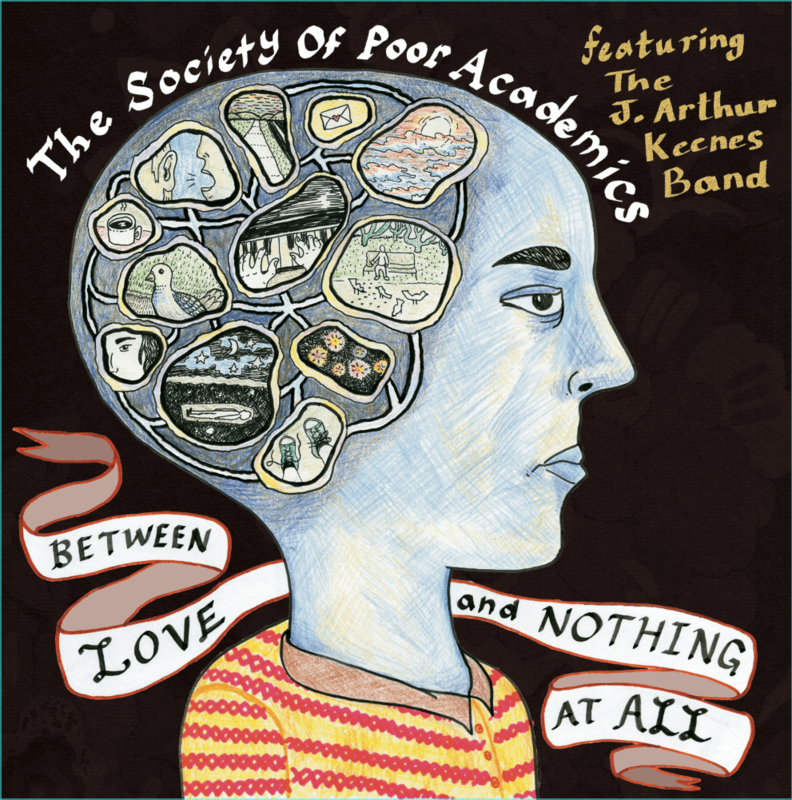 The J. Arthur Keenes Band. It was a lot of fun working together, and I hope I get the opportunity to do so again at some point in the future, one way or the other. In relation to the EP, we also put out a music video for the song “Weekend”, filmed and edited by Oslo based VJ and visual artist Mads Faste Liang Nilsen (also known as Mads Meskalin). You can see the video below. As a small treat (and as a half-cynical marketing move), I’ve made the song in question available for downloading for free below! Please enjoy, and hopefully you’ll feel inspired to use a couple of dollars to purchase the full-length EP. 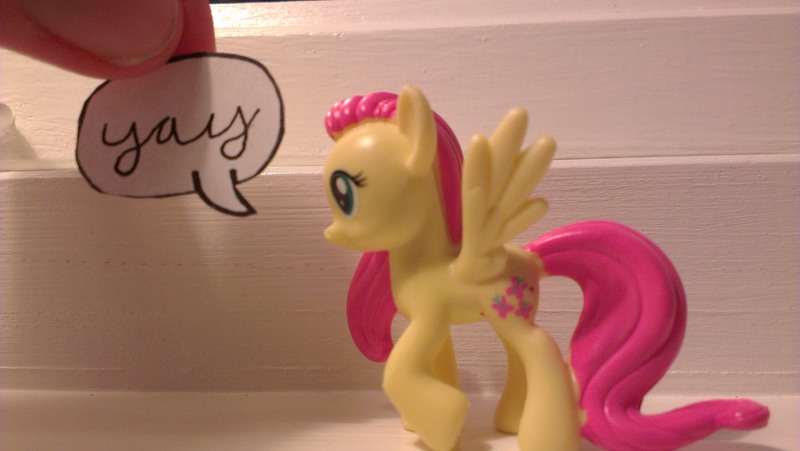 I recently turned 29, and as the word has spread that I’m a fan of the show My Little Pony: Friendship is Magic, I received a handful of pony-themed gifts from various friends, which I’ll show off below. 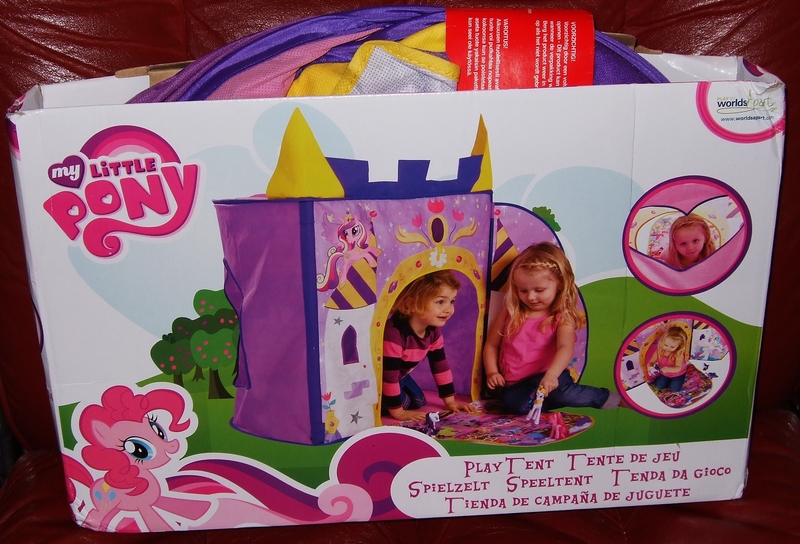 A pony-themed play tent, featuring Princess Cadence. I guess it’s supposed to be her palace. 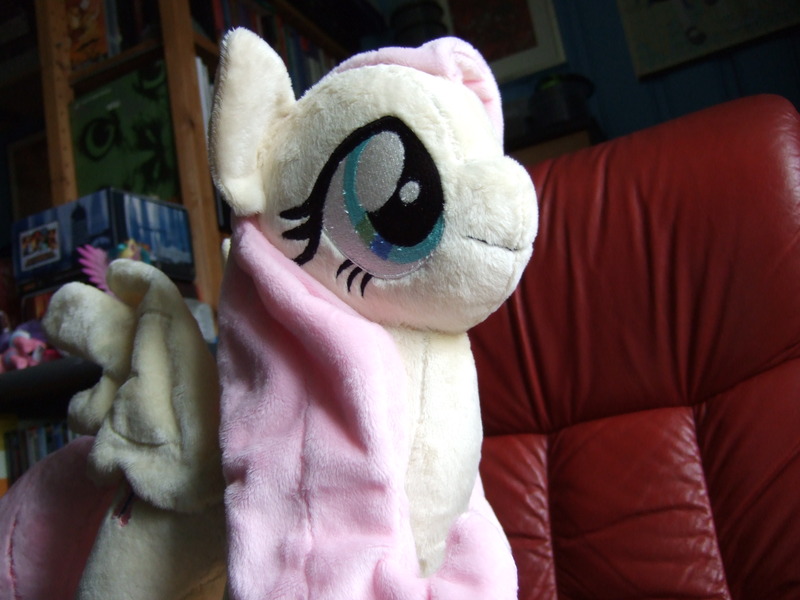 Perhaps a size too small, and probably not suitable for camping, but I’m sure I can find good use for it still. 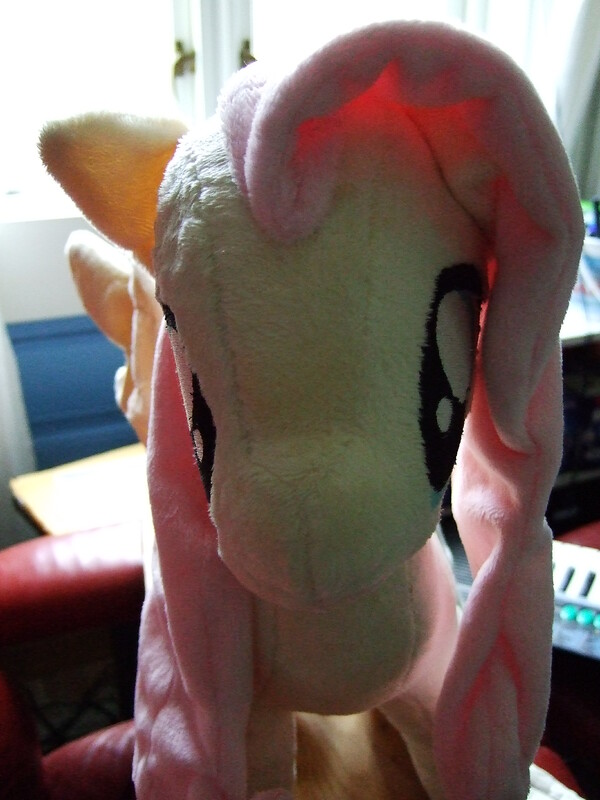 Could maybe even be used as some sort of prop during concerts, if I wanted to. A Christmas-present-turned-birthday-present due to a lack of gift wrapping. 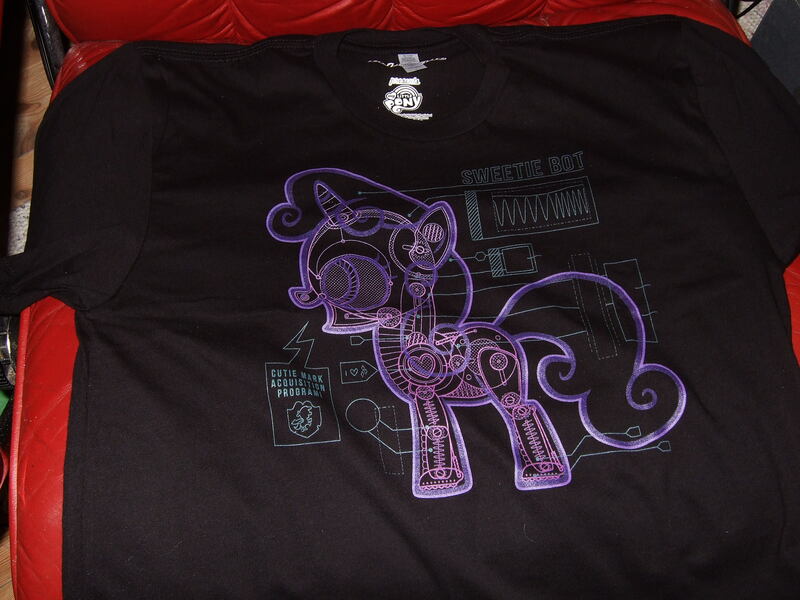 It’s a Sweetie Bot t-shirt, from WeLoveFine. 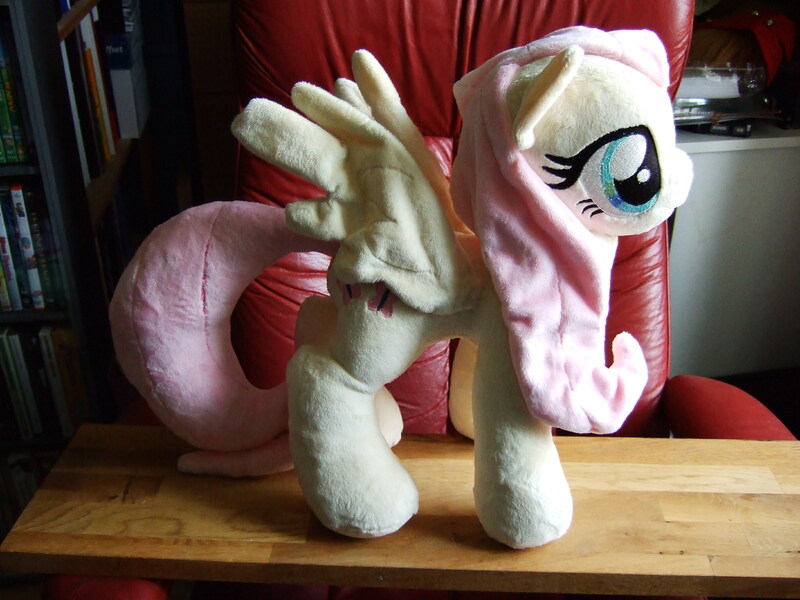 Sweetie Bot is of course the wonderful fan re-interpretation of Rarity’s little sister Sweetie Belle from the Friendship is Witchcraft series (most prominently featured in the episode “Neigh, Soul Sister”). I’m guessing very few will actually get the reference, but that only increases my hipster cred. I was pleased to find that it fit pretty well; it’s a size small. Size medium most likely would have been too big. 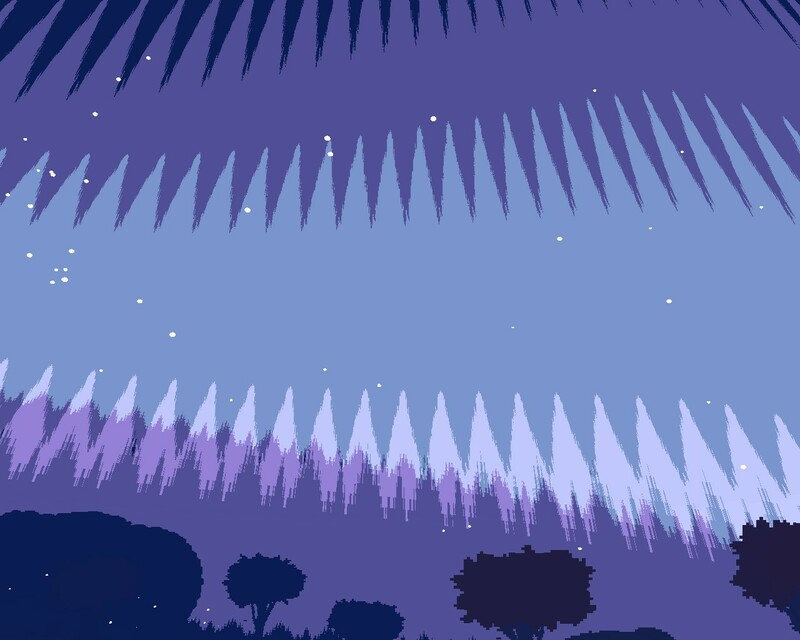 A night light, based around the Princess Twilight Sparkle alicorn design. 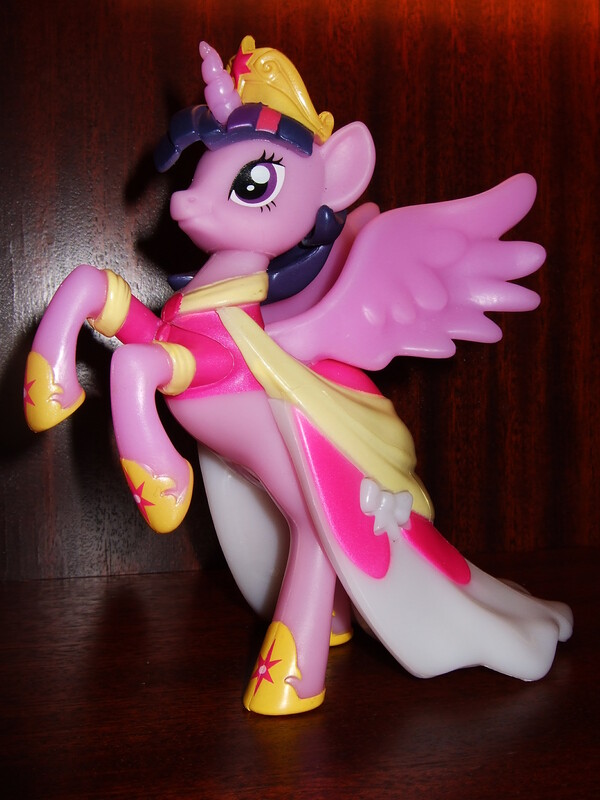 This looks gorgeous, especially when compared to much of the other pony-related merchandise Hasbro has put out. So even if you don’t use it as a night light, it still functions as a nice decorative piece. 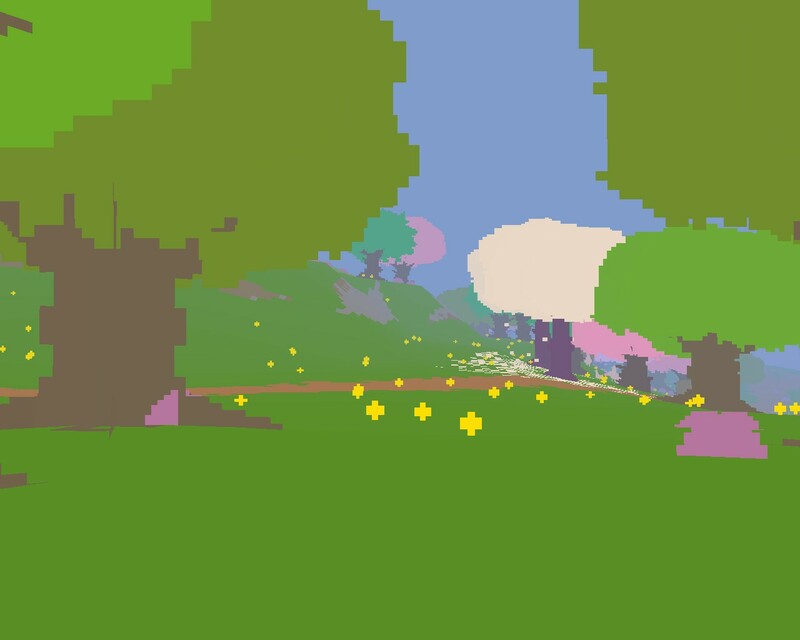 You can see it in action in this YouTube video. 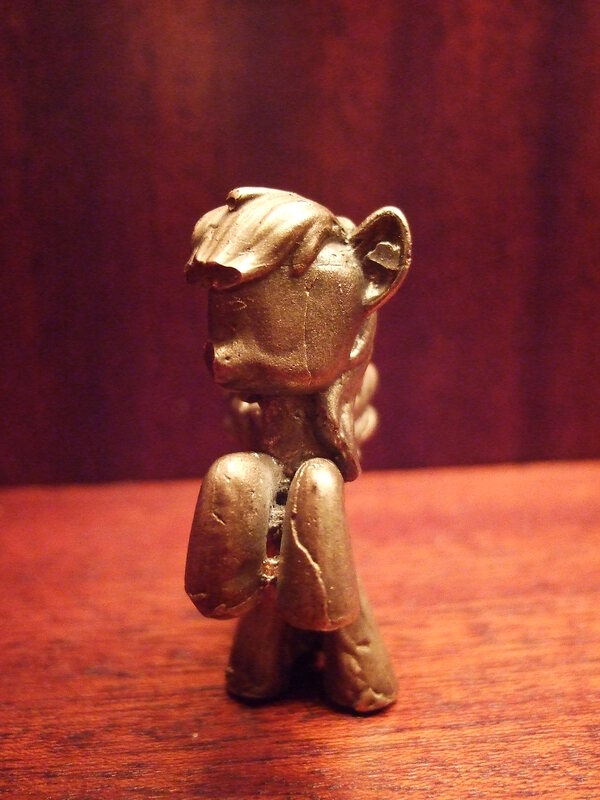 This is the most interesting and unique item, not available through any outlets: a solid bronze mini-pony. 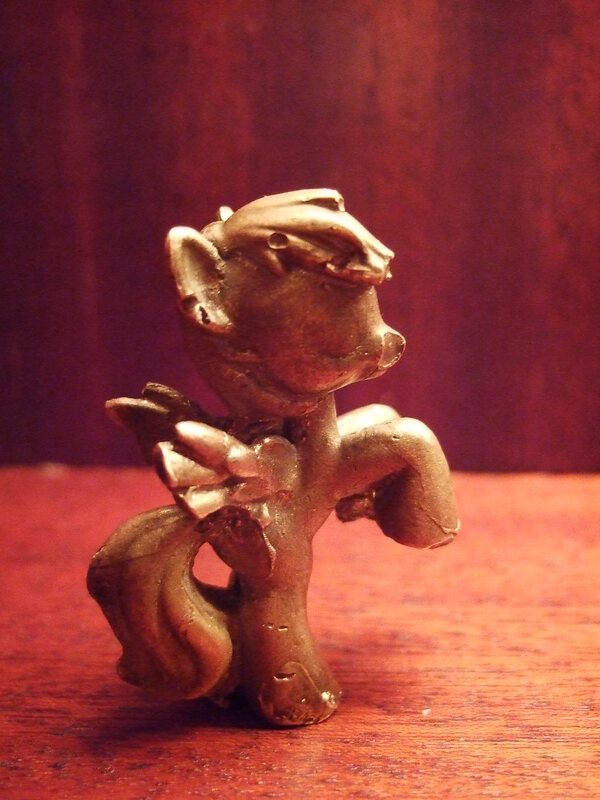 It’s molded after the blind bag pegasus figures. 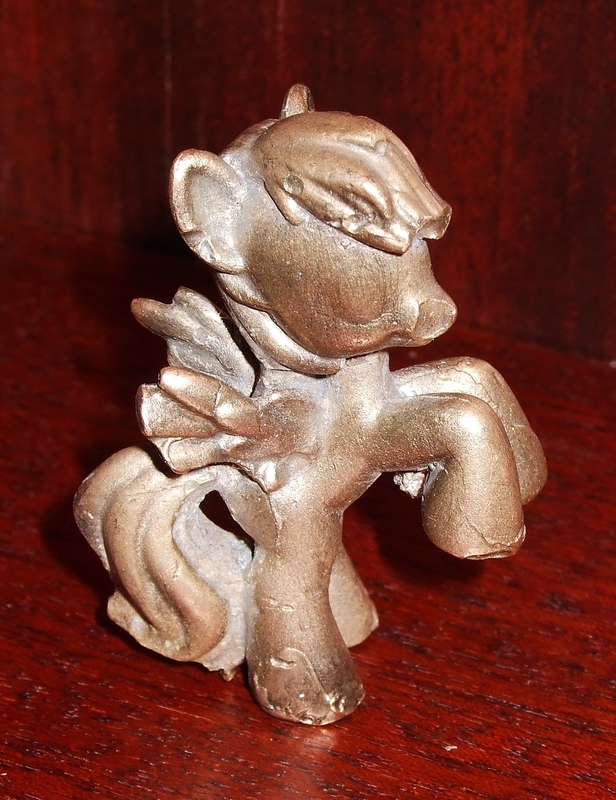 My friend made a few of these as an art project, but given the high price of bronze these days, it was way above my pony budget. So she and another friend both chipped in to cover the raw material costs, and got me one! 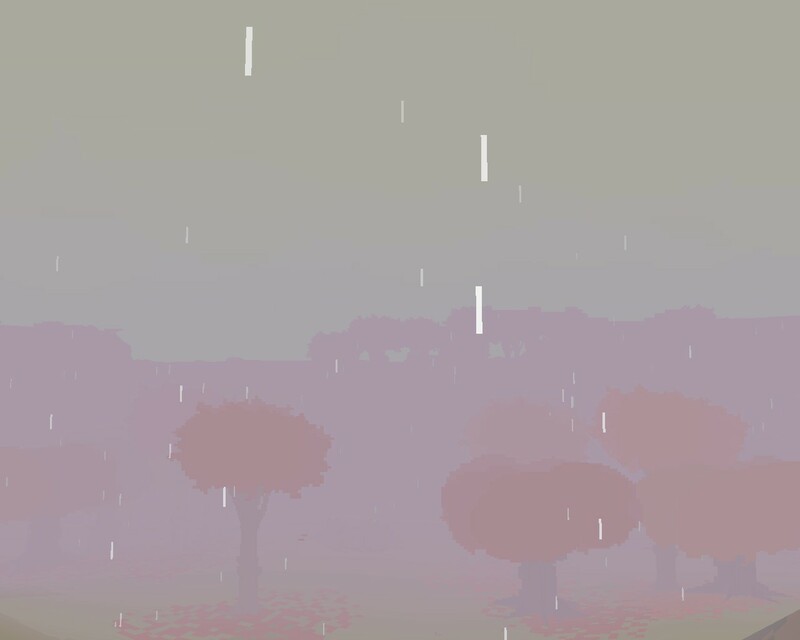 It has a few “imperfections” as you can see, but I think it rather fits the whole aesthetic of it. It gives it a slight worn look, as if it were an antique, rather than looking slick and modern. You can see more pictures below. 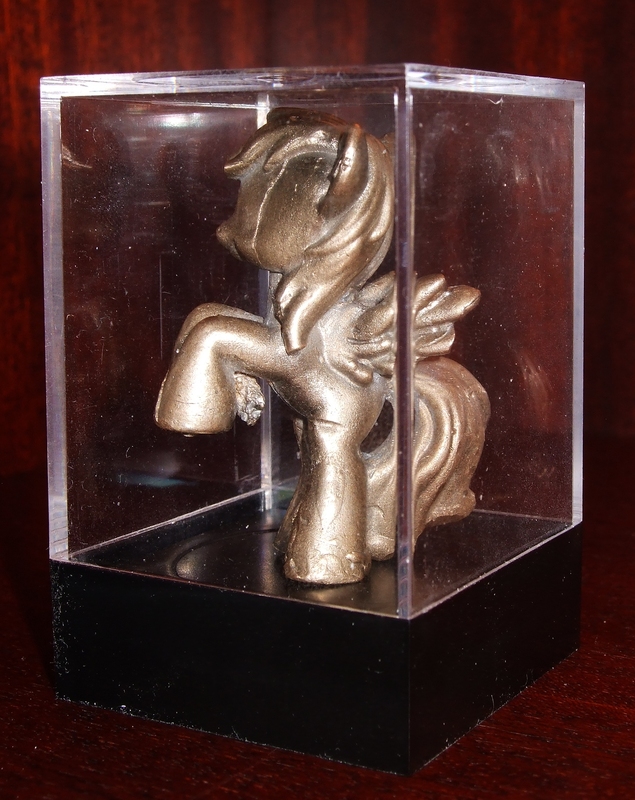 I even found a good mini display case for her! It was originally made to hold roleplaying dice, but I think it works better like this. I guess I can say I’m a casual fan of Jim Guthrie, an indie singer-songwriter from Canada. 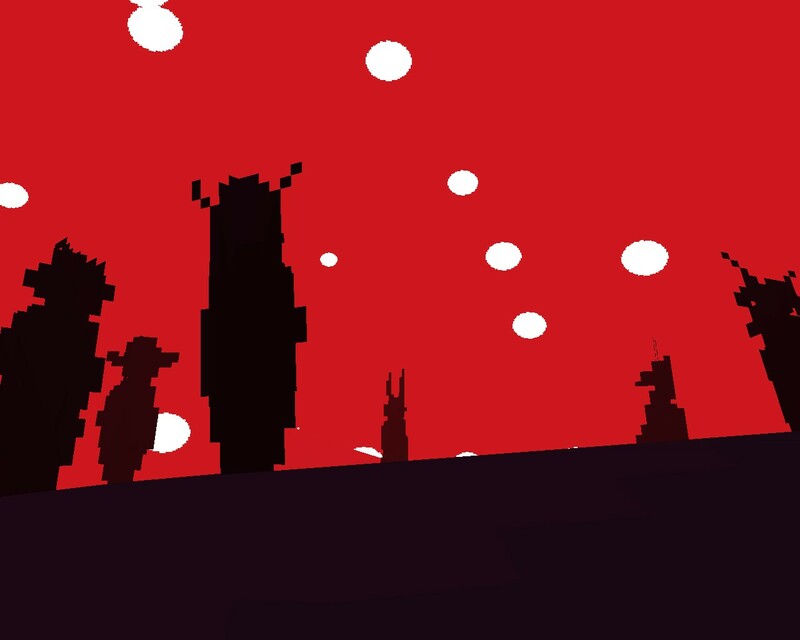 Like many others, I first really became aware of him through the work he did doing the scores for Indie Game: The Movie and the game Sword & Sworcery. He is also 50% of the Canadian super duo Human Highway, which I featured back in #120. 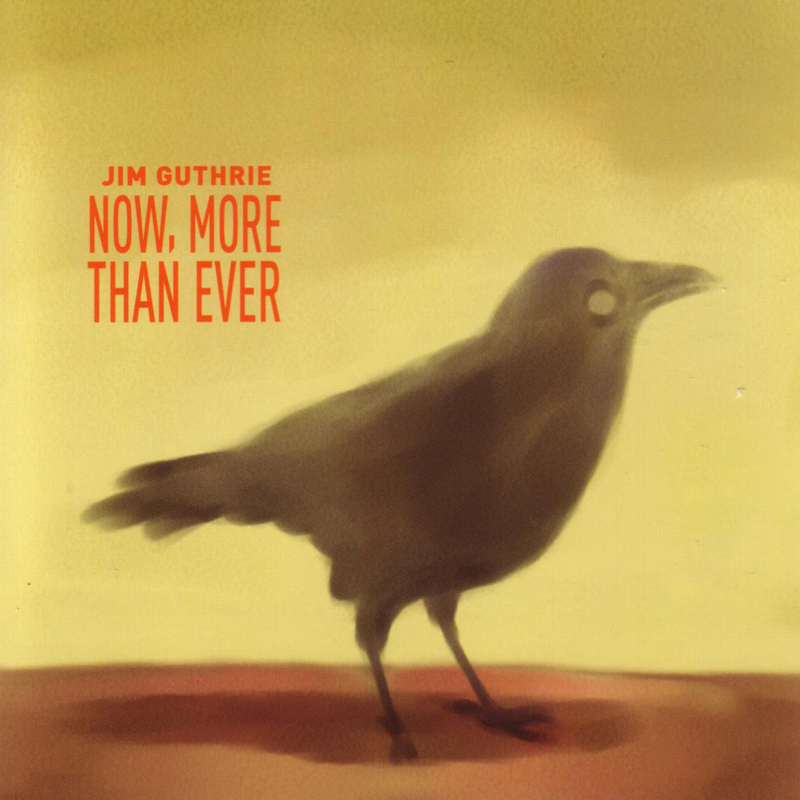 I’m not yet super familiar with his discography and music (hence why I say I’m a casual fan), but I got the rather unexpected Jim Guthrie Humble Bundle when it was offered. I say unexpected, because the Humble Bundle mainly do game-centric bundle deals, and this was the first time they had done one that was specific to a musical artist. 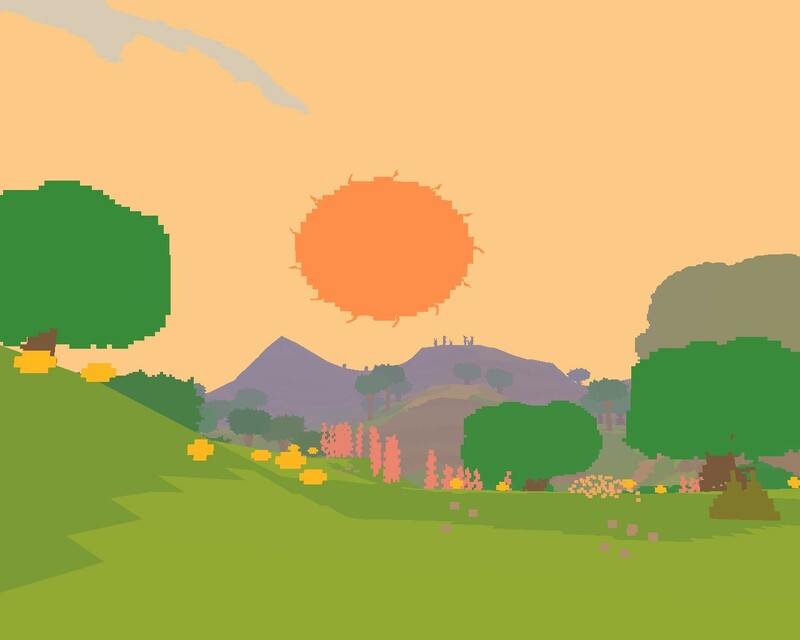 But I guess he might have good relations with the folk in charge of the bundling operation, as both Indie Game: The Movie and Sword & Sworcery have been featured through them – complete with free copies of the Jim Guthrie composed scores. The bundle featured the bulk of his discography, and I’ve been dipping into it whenever I’ve remembered to. In particular his latest album, Takes Time, was a very pleasant offering. 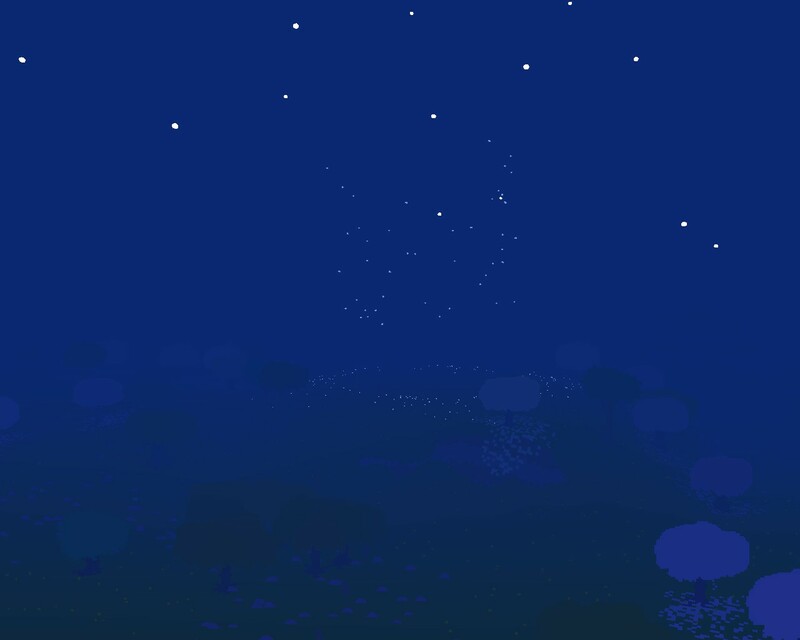 (So I find myself often returning to that one rather than exploring the other releases more fully.) The bundle did not include the extended, double disc version of the album Now, More Than Ever, but only the unextended single disc version. Which was disappointing. I’m guessing it might have been due to copyright issues and/or label agreements, wanting people to still have an incentive to purchase the physical product. Among the bonus tracks to be found on this extended version, is a brilliant and playful synth pop cover version of the Kate Bush classic “Wuthering Heights”. I listened to it repeatedly a few weeks back while I was fighting a nasty cold. (Fever, sore throat, coughing, and all that yucky stuff.) It actually made me consider reading the book by the same name which the song is based on, or at least watching one of the dozen plus filmed dramatisations available. Now that the illness has passed, so has my desire to do so. But this song is still excellent. 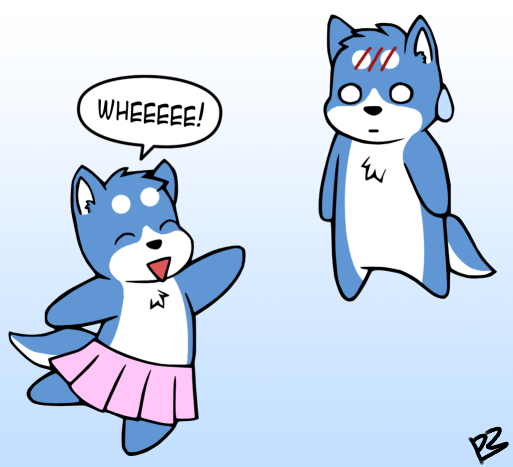 Early this year, I finally watched the anime Ginga Densetsu Weed. It has been on my backlog for some time, being a big fan of its predecessor, Ginga Nagareboshi Gin – or known as Silver Fang here in Norway. Here are some of my rough thoughts and feelings on the show. I’m not very enthusiastic for the show’s protagonist, Weed. As opposed to his father, Silver/Gin, Weed was practically born into greatness. In the first series we got to follow Silver from his birth and see how he was raised and trained, and how he worked his way up to become who he is. We get to see as he builds close ties with Daisuke and Gohei and many other dogs, who all contribute to help shape his character in various small ways. It takes several episodes before Silver even starts on his big journey. We get to understand the character, what helped shape him, and we feel for him for all the hardships he gets exposed to. In Ginga Densetsu Weed we’re more thrown into the story, without any build up, and we’re quickly told that Weed is great – but without really understanding why he’s great, besides from being lucky with his pedigree. Rather than learning from anyone else, looking up to other dogs and using them as examples for his own behaviour, Weed seems to mostly teach everyone else how to be better. I quickly tired of how Weed was praised up to high heavens by everyone he met. That is, with the exception of those who wanted to kill him – but many of whom were converted when the realized how merciful, just, and super a guy Weed is. “Wow, Weed sure is a super duper guy, he sure is alike his father!” It was almost like some sort of fanfic, where it’s not unusual for the author to introduce a new character and have the character pretty much be super awesome from the start, without having sufficiently established how and why the new character is so awesome. I also felt very unsure about Weed’s “thou shalt not kill” philosophy, and how consistent it is. He engages in several battles through the series, he sends other dogs into battle, and he’s responsible for the death of many dogs both directly and indirectly. Like with “P4”. Still he goes into a hissy fit when Jerome kills two assassins who outright states that they intend to kill Weed, and Jerome is expelled from the pack as a result. What about all the other dogs in the pack who have killed? Was there something special about this case that really warranted Jerome’s expulsion? With Weed’s first confrontation with Hogen (at least, I think it was the first), he tries to outright kill Hogen with his super attack, but his attack is thwarted as Hogen uses another dog as a living shield. So the living shield dies instead. It doesn’t seem like Weed is particularly bothered by the fact that he took a life in this situation – and a life he didn’t intend to take, as he was aiming to kill Hogen. But then later in the series, when he’s asked to give Hogen the finishing blow, he refuses to do so. He says they must forgive Hogen for what he has done. Yet he still refuses to forgive Jerome for what he did. I recall Weed saying to Jerome, at one point, something like the following: “You will always be my friend, but I cannot forgive you, as you took a life and life is precious.” Yet he apparently thinks they must all forgive Hogen? And it was very convenient that the lightning killed Hogen at in the end! And again, Weed doesn’t seem overly upset about Hogen’s abrupt death. 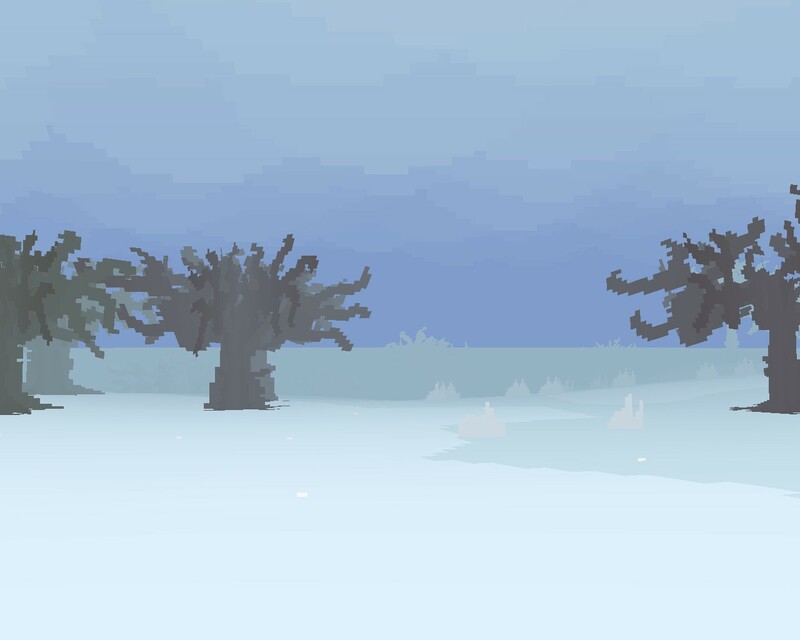 The ending of the fight with Genba, Hogen’s brother, was a bit… odd. Weed, being a staunch pacifist, is assured by his troops that Genba wasn’t murdered in order to achieve victory. No, instead they merely gave him major brain damage which apparently made it so he was in a constant rage and couldn’t distinguish between friend and foe, killing everyone in his near vicinity! So Genba gets put down by his own brother after having killed several of Hogen’s underdogs. I fail to see how that’s better than outright killing someone yourself. The evil dogs also seemed a bit too one-dimensional and cartoonish. Especially Hogen, who only seemed to be after power because he was evil. Towards the end he suddenly states that his real goal are the humans, but it’s never quite explained how his lust for power and how taking over the territory play into his anti-human agenda. I think it would have been a better story if the villains could have been made a bit more… credible, a bit more believable and sympathetic. Maybe Hogen and a few of the other dogs had been test subjects at the laboratory together with P4, and have escaped from there together, sworn revenge on humanity, and worked on expanding their own pack to aid them in their anti-human agenda. Maybe they weren’t after the territory at all, and just sought revenge over the humans some other way. Weed and the others would want to stop them, as they’re not too keen on Hogen and the others killing innocent humans. And they wouldn’t needlessly abuse their subordinates, but do what they must to reach their goal – which could involve killing dogs who stood in their way. I think something like that could have helped make the series better, at least speaking for myself. As it was, P4 was pretty much just a “random encounter” with no deeper bearing on the story, and Jerome just… hung around afterwards. So if they had made a few tweaks, maybe something like I suggested, P4 wouldn’t have been quite so redundant and Jerome would’ve had a greater reason to stick around and to help fight Hogen and his gang (since he then would have known Hogen, and his sense of duty as a watchdog would give him additional motivation). It’s also a bit insulting to us Silver Fang fans, how Silver is reduced to a sort of MacGuffinthrough most of the series, and doesn’t contribute much to the story. Considering how many other characters manage to go beyond their own boundaries in the series, who should have died after an attack and are completely exhausted, but who still manage to be victorious, snatching victory from the jaws of defeat… one would think that Silver – of all the character – could manage to do something similar. But instead he lies beaten and apathetic through the bulk of the series. And, there was a bit too much crying through the series. Whether it was out of sadness, or because they were so moved (when, for example, witnessing just how fantastic and merciful Weed is). Sure, it’s an understandable reaction in certain situations, but just like how so many characters exclaimed what a wonderful guy Weed was, it just got a bit much in the end, and therefore rather silly. But I have to say that one of the emotional highlights for me was Teru and his father. It was hard holding back the tears at the climax of that sub-plot. The original series was just a bit more… epic, with an overall better narration. Here, things felt less focused and less grandiose. They go to save Silver… then it seems like they are going to try to recruit dogs to help them in the battle against Hogen – similar to how Silver and the others tried recruiting dogs in the first series – but they seemed satisfied after they had convinced only Kyoushiro and his gang of pups to join them, as they didn’t make any more active recruitment attempts (though new dogs did end up randomly dropping in and joining up along the way, such as Hiro)… then they travel back again where they came from, as Hogen and Silver have moved… and the entire conflict was a power struggle between the dogs about territory. 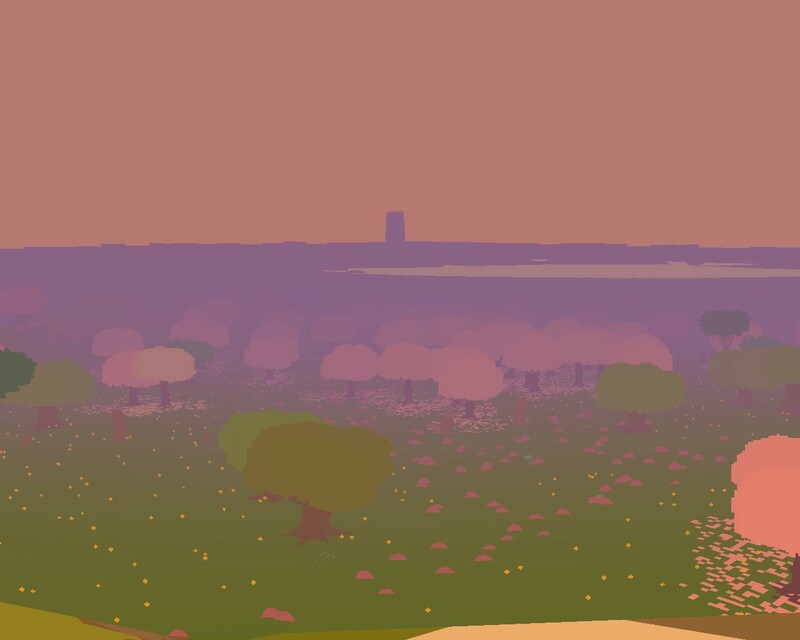 Didn’t help that much of the landscape looked very similar and dull, and I found it hard to fully grasp where they were in relation to everything and everyone else. 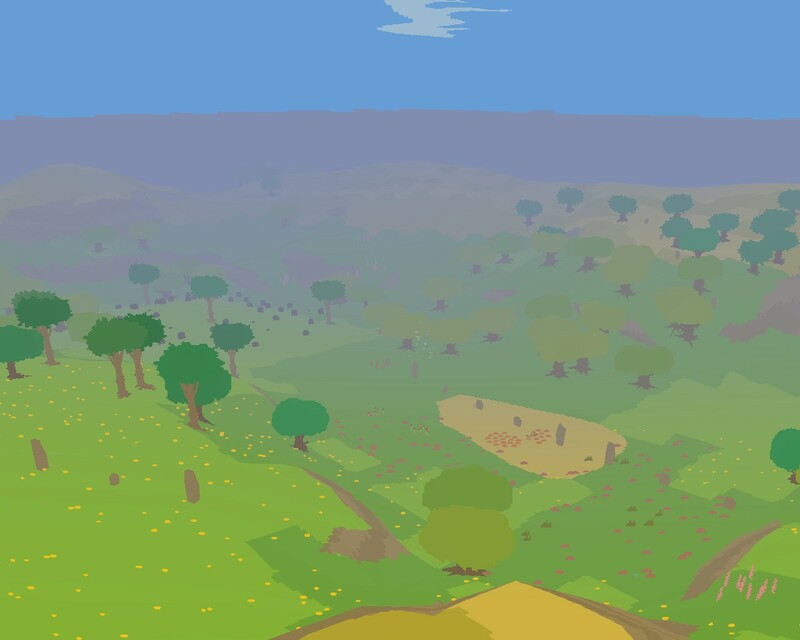 They might have travelled, but the landscape still looked pretty similar (if not the same), and we’re not given much of a sense that time has passed. It should also be mentioned that there are discrepancies between the anime version and the original manga of Ginga Densetsu Weed. After having rooted about some in the Ginga Wiki, I found out that in the manga, Jerome apparently survives; Sniper returns (and submits to Hogen); Weed has siblings; and there are a total of five story arcs, and the anime only covers two of them. The different arcs appear to be largely unrelated to one another though, not really forming any greater overarching storyline. But I haven’t actually read it myself. I’d love to do so, but it’s not published in English* nor any of the Scandinavian languages (Danish, Norwegian, and Swedish). There are fan translations available online, but reading scanned comic book pages on my computer or mobile phone doesn’t seem too appealing. Maybe if I had a touch pad. There’s a lot to pick at with the series, as it has many faults of varying sizes, but it was definitely entertaining.But definitely not as satisfying as its predecessor. *The first three volumes were actually published in English, by some up and coming Western manga publisher. Unfortunately, the published disappeared. It did seem like an odd decision to publish Ginga Densetsu Weed rather than starting with Ginga Nagareboshi Gin, and I’m guessing the sales weren’t great. The Postal Service‘s “Such Great Heights” seems to have become a bit of a modern pop standard. It’s a good song. It’s catchy, slick, with a few clever lines and a cutesie love theme, and there are now over a dozen released cover versions. 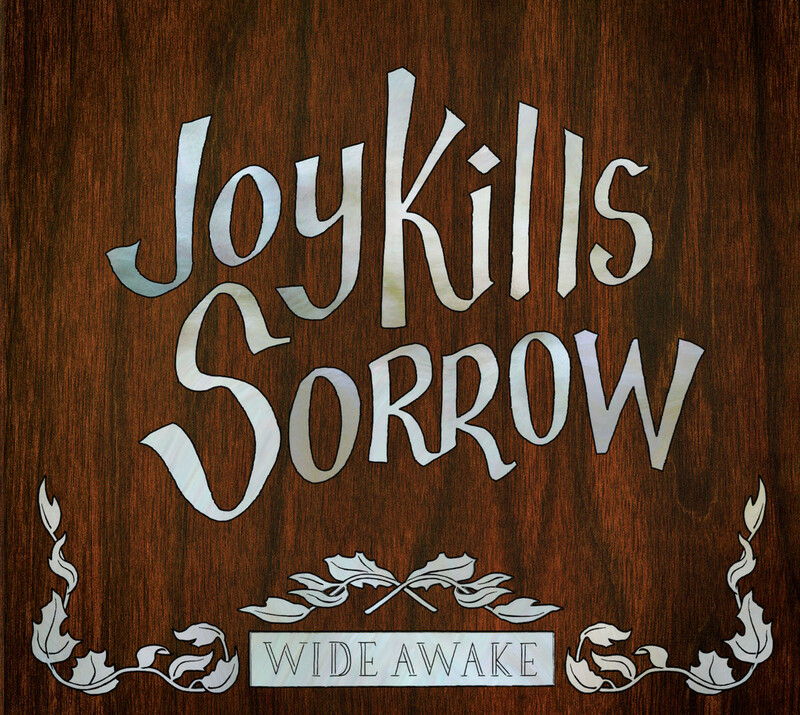 When I was recently browing YouTube in search of Ben Fold’s well-known cover versions of the tune, I happened to stumble over this music video by the bluegrass/indie folk band Joy Kills Sorrow, released in relation to their EP Wide Awake. Not much to say, other than that it’s pretty good, and maybe to point out the curious rapid muted rhytmic strumming they’ve got going, which seems to be a staple of the band. I’m sure there’s a more proper term for it; when you play a string instrument – usually the guitar – but you clamp down on the strings to keep the notes from resonating. It’s not uncommon to do – I’ve heard it used many times through earlier songs by The Mountain Goats, for example – but it is something you usually do sparingly, and not throughout an entire song. On several occasions, DLC (downloadable content) has discouraged me from buying a game. The most recent case being Crusader Kings II. CKII is a part of this week’s Humble Bundle sale; for about 6 USD, you get both CKII and several other games. None of the other games being offered really intrigues me, but 6 USD for CKII doesn’t seem like a bad deal. Except, it doesn’t include any of the DLC. And the DLC for the game costs around 5 – 15 euros per expansion. And there are currently five such downloadable expansions being offered. So you’d have to use a small fortune buying it all. And seeing as I don’t want an “incomplete” gaming experience, and as some of the DLC looks pretty interesting, I either want to play the “full” game with allof its DLC installed, or rather not play it. Therefore I refrain from purchasing it, figuring they might offer some package deal in a year or so, so I can buy everything at once. This has happened with several other games. I’m considering making a purchases, but then I find out it has some DLC I might have to purchase separately, so I rather don’t buy it. I’m curious if there are many other consumers out there who do this as well, or if I’m a rare case. The letters are printed at the bottom of the bags, and can be hard to make out. 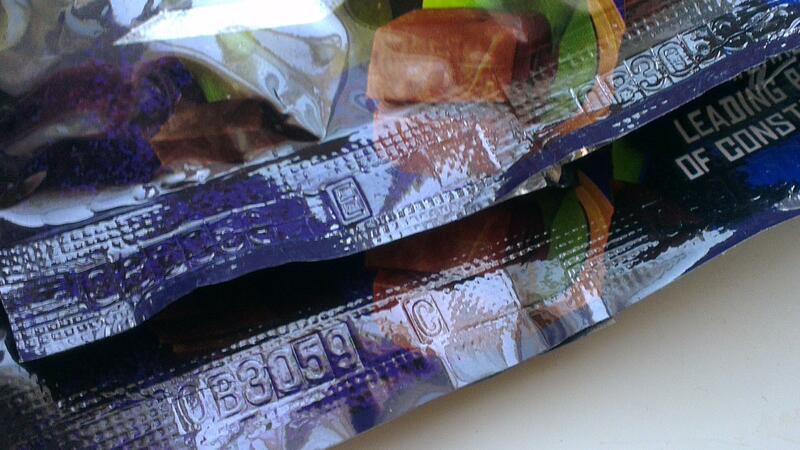 There’s a lengthy number as well, but this is a red herring, as this is the same on all bags (OB3059). The letters are printed to the side of the red herring. The letters E and C printed on the bags. 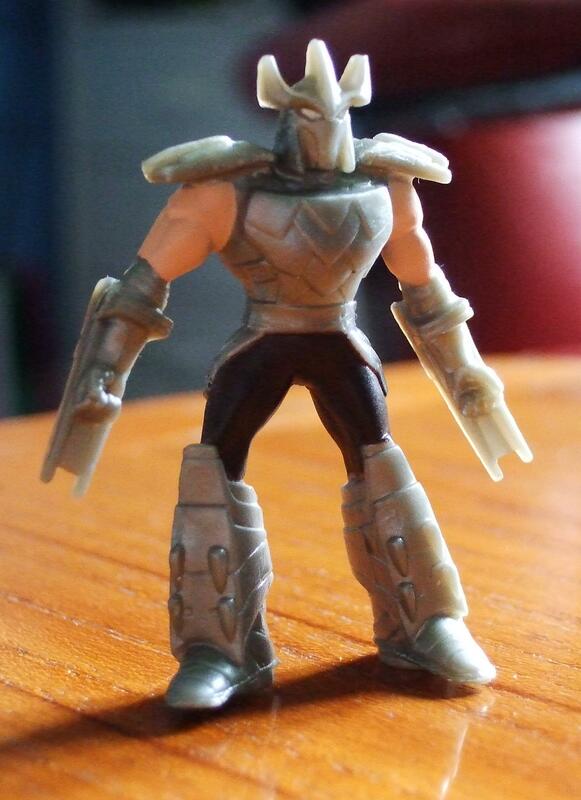 Shredder, aka. 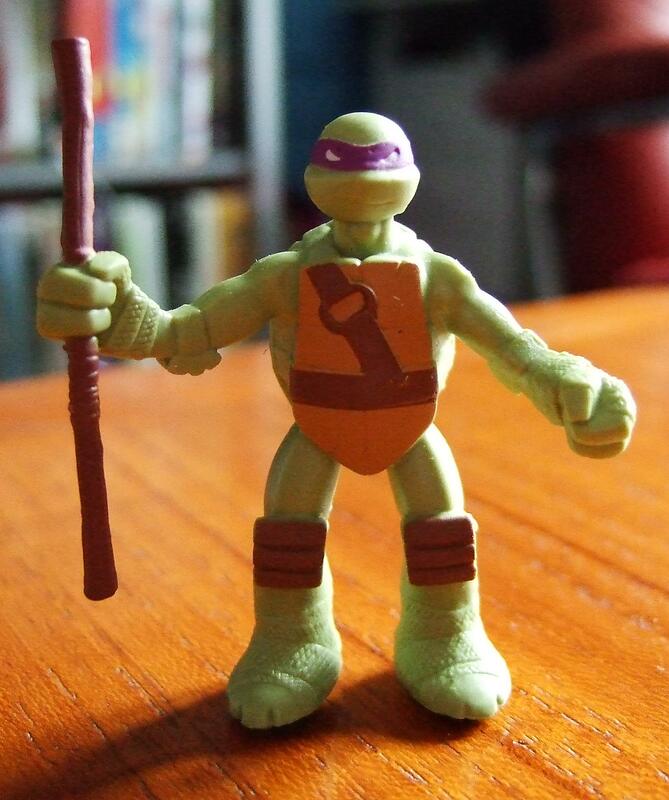 the letter F.
The turtles are also lacking colour on their protective ninja gear; the knee pads are only coloured on the front, the elbow pads aren’t coloured at all, and the “protective ninja cloth” on the their hands and feet also remain uncoloured. 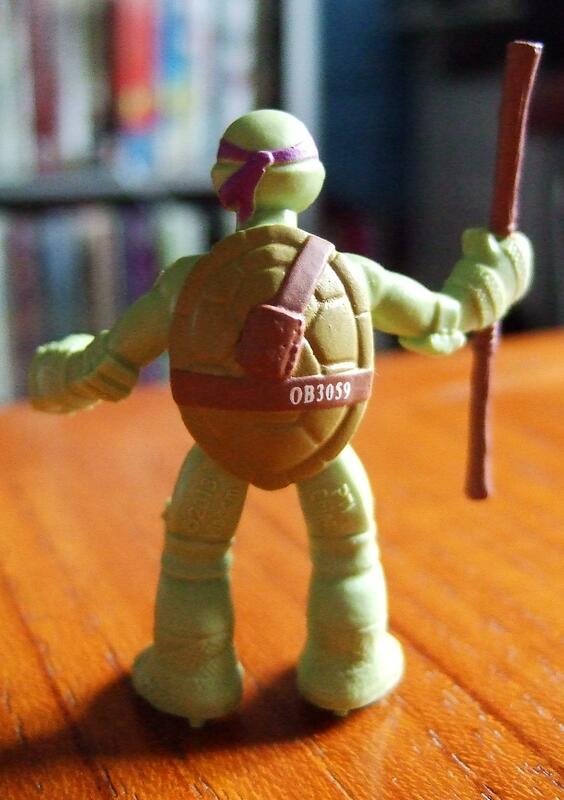 As you can see of this figure of Donatello. 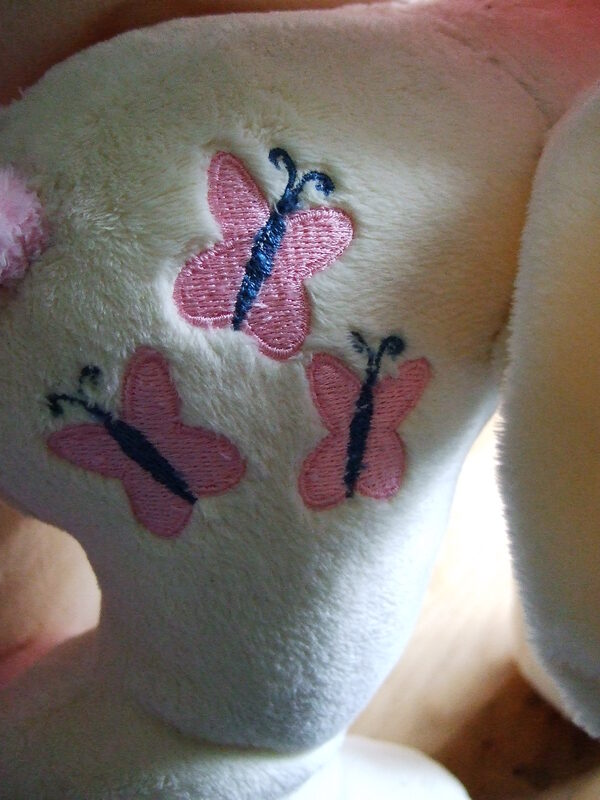 The figures also have these… holes under their feet. As if they were Lego figures, or were meant to attach to some stand. 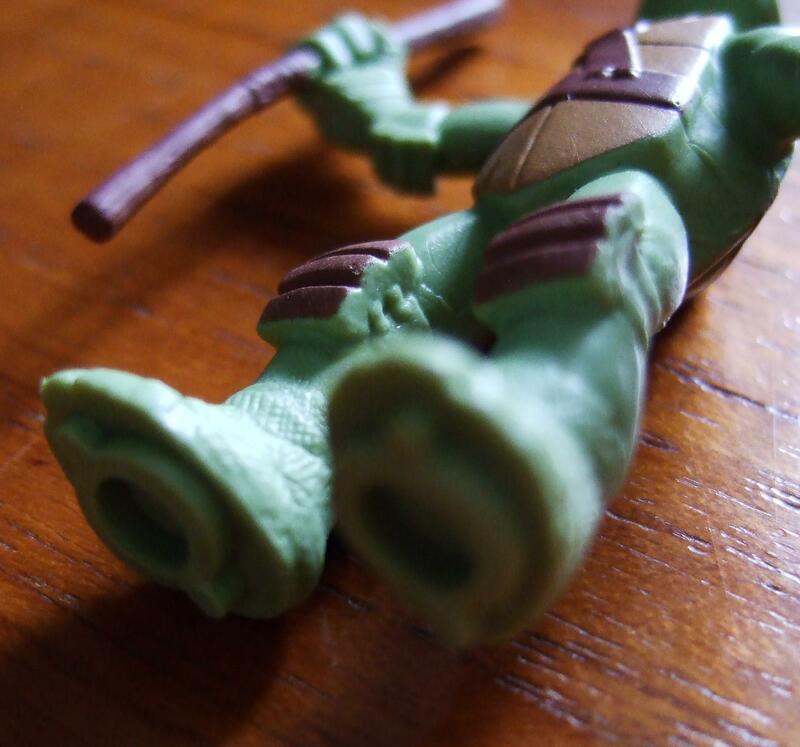 Unfortunately the figures do not come with a stand, and the holes protruding from their feet make them a bit more unsteady and prone to falling over. Maybe there’s some sort of playset you can buy for the figures? But I haven’t seen any. My goodness, what’s wrong those feet? Despite these somewhat annoying flaws and design decisions, they look pretty good overall. So if you’re intereated in the series at all – and Nickelodeon’s reboot is pretty excellent (even if I fear the CGI animation will feel outdated in five to fifteen years, and will be hard to watch) – they’re worth looking into. The gang – minus the foot soldier, which I got after this was taken.